Ease your mind over its four- to nine-course meals. You may be familiar with the Rothko Chapel. Located in Houston, the structure contains nothing but the artist’s iconic color-field paintings and benches on which visitors can sit to admire them. At once an unchanging gallery and a nondenominational worship space, Rothko Chapel (completed in 1971) gives way to reflection, an experience some have likened to a religious experience. Perhaps this is because, when faced with such stark minimalism, all attention naturally turns back to the self—more specifically, the inner self. 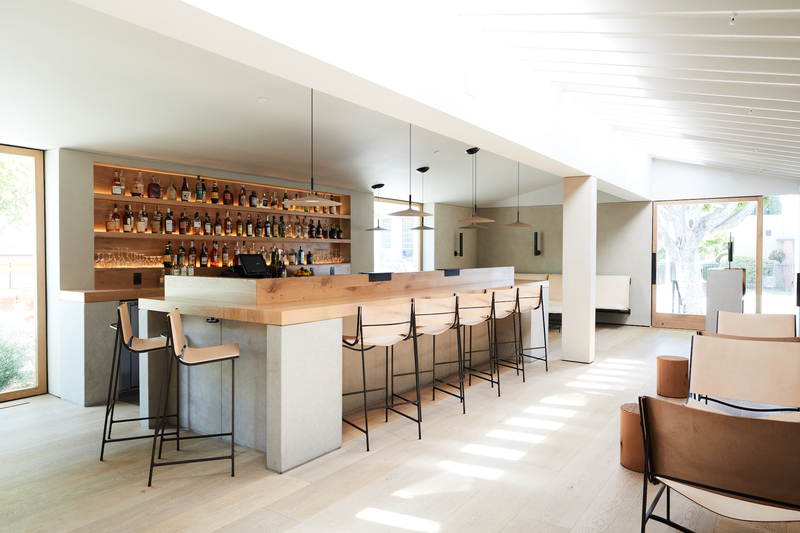 Auburn, a new Los Angeles restaurant concept from chef Eric Bost (formerly of République, Guy Savoy, Alain Ducasse) and Klein Agency, is neither gallery nor worship space, but its meditative quality is not dissimilar from that of the Rothko Chapel’s. 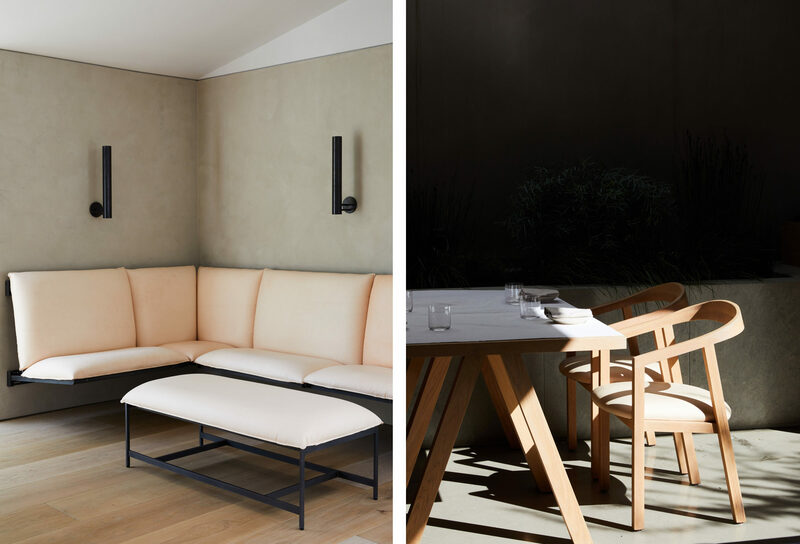 A minimalist’s wonderland, Auburn celebrates craftsmanship—in both cuisine and design—by putting it on full display. Below, Klein Agency’s Maša Kleinhample walks us through the completed design. Klein Agency is a member of The List, the destination for all things Surface-approved. Want to join The List? Contact our team to find out how to apply. Inspiration: Auburn reimagines what a fine dining experience in Los Angeles could be: a warm, domestic shell with the fine-tuned operations of an internationally driven kitchen at its hearth. With this concept in mind, we knew that the space should feel like stepping into a friend’s home. The material palette had to be soft, warm, and inviting. Like Chef Bost’s food, the architecture had to feel simple. So, we developed the space as a series of small rooms, each with its own light and materials. The bar is defined by steel and leather, the main dining spaces by white oak and vegetation. Blueprint: A balance between old and new defines the entry into the space. Entering the restaurant along an original clerestory really highlights the division between what was original and what was added over the years. The main dining space opens up to the sky through five large incisions in the wooden patio ceiling structure. With planters below each cut, diners can feel as if they are seated in a wild, rural landscape. Through a large wall of solid oak windows, the main dining space continues inside directly adjacent to the open kitchen. Chef Bost’s high-performance kitchen continues the materiality of the dining room with textured wall tiles in natural hues and solid white oak shelving suspended above his stainless steel counters. The final, most exclusive, dining space is a room set for 10 guests equipped with its own private garden. 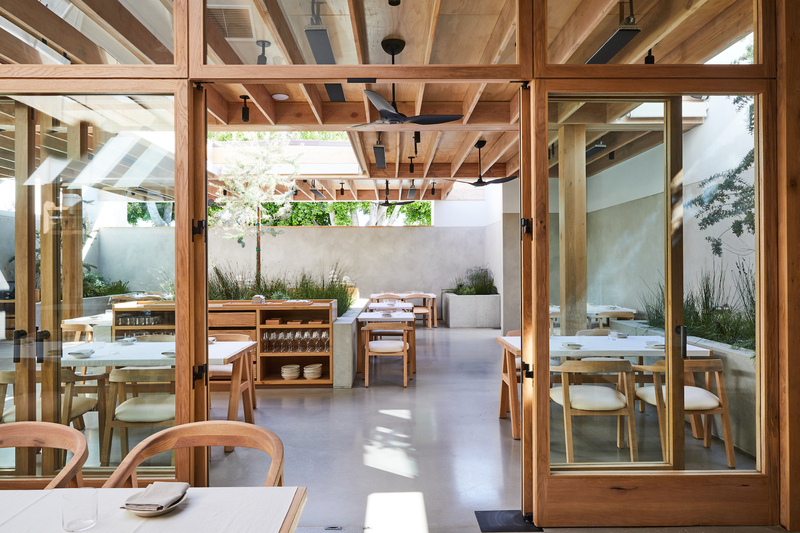 Two large oak sliding doors allow the diners to connect to the garden and its cool evening breezes. 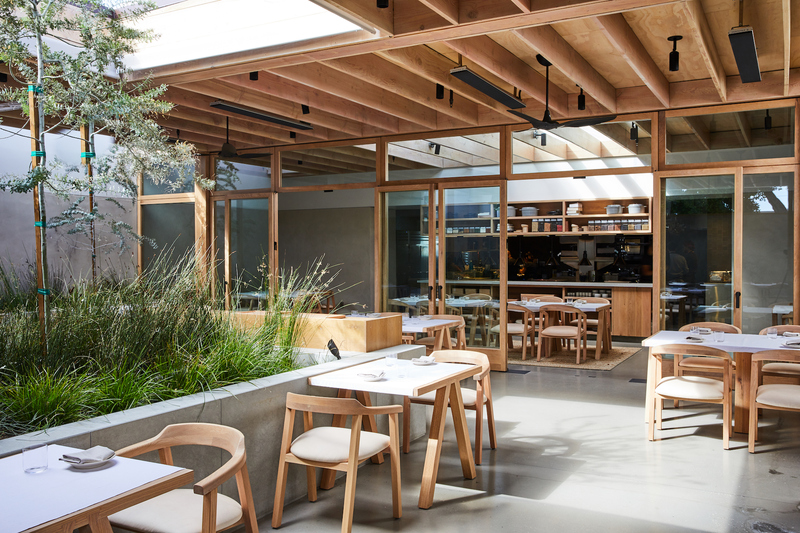 Materials: With solid white oak, thick limestone slab, vegetable-tanned leather—materials that age well—the space, exudes this effortlessness perfect for Bost’s food. Working closely with a small team of craftsmen, we also designed and fabricated a bespoke range of dining chairs, dining tables, lounge chairs, bar seating, lighting elements, and hardware tailored to compliment Chef Bost’s concept and our minimal spatial strategy. Pockets of light and native greenery also connect our interior and exterior spaces. Takeaway: It’s beauty through simplicity. Auburn celebrates passion and craft though an intertwined approach toward honesty in space, hospitality, and food. By crafting it restaurant out of solid materials that will only improve through time, it will age through use, touched forever by the gentle hands of its visitors.